down with parvo. She pulled through and has been a fighter ever since. to Tiffany, she was not thrilled. go overseas for a year. Bailey and her step-mom, tiffany had to find a bond. brian and Joanne saw potential and Tiffany was dedicated. Today, bailey is an amazing dog. 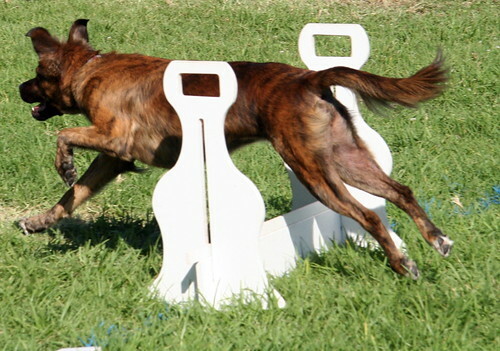 She LOVES flyball and she is good at it. crated to protect the couch. She has good manners and loves her step-mom! maybe she will run for him too! The true hound on the flyball team. 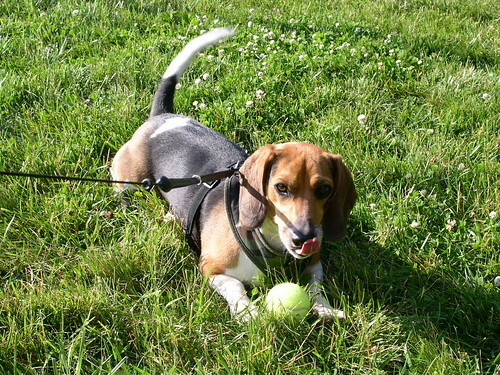 Indie, the beagle-daschund mix has the biggest bark on a team and is often named by the team captains “the cheerleader.” Indie finds flyball irresistible. Why not if he gets everything: exercise, attention, praise, treats, chat with his doggie friends, and fresh air. Indie and his mom Linda have been on the flyball team for a year now. When not “ballistic,” Indie is a keen eater, kisser, and a shy admirer of the after tournament massages. Life couldn’t be better!